​​1. What is the time frame of the awards? 2. What does "hosting" a meeting at your lodge mean? It means that you physically invited a lodge to visit by written invitation or oral invitation that has been recorded in the lodge minutes. 3. When visiting youth organizations, does attending an installation count? Yes, it does, but so do other visits throughout the year. 4. What does "having a program" consist of? Having a program means it is ongoing or recurring, with documentation of when event or action occurred, who accomplished and outcome. 5. What is "active in recognized local community"? This means participation over and above just providing financial support, including providing "time and talents" to support the community. 6. 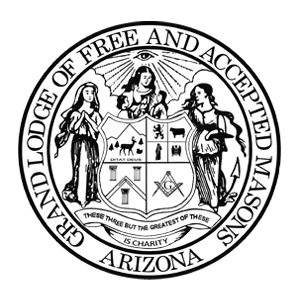 How is Masonic Education documented? 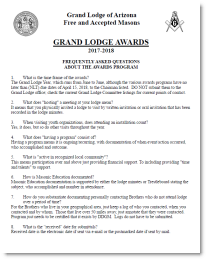 Masonic Education documentation is supported by either the lodge minutes or Trestleboard stating the subject, who accomplished and number in attendance. 7. How do you substantiate documenting personally contacting Brothers who do not attend lodge over a period of time? For the Brothers who live in your geographical area, just keep a log of who you contacted, when you contacted and by whom. Those that live over 50 miles away, just annotate that they were contacted. Program just needs to be certified that it exists by DDGM. Logs do not have to be submitted. 8. What is the “received” date for submittals? Received date is the electronic date if sent via e-mail or the postmarked date if sent by mail. You will find the individual forms for each award on the associate web pages. If you would like a single file that contains all forms, please send a reqest to the webmaster using the " Contact Us" page.